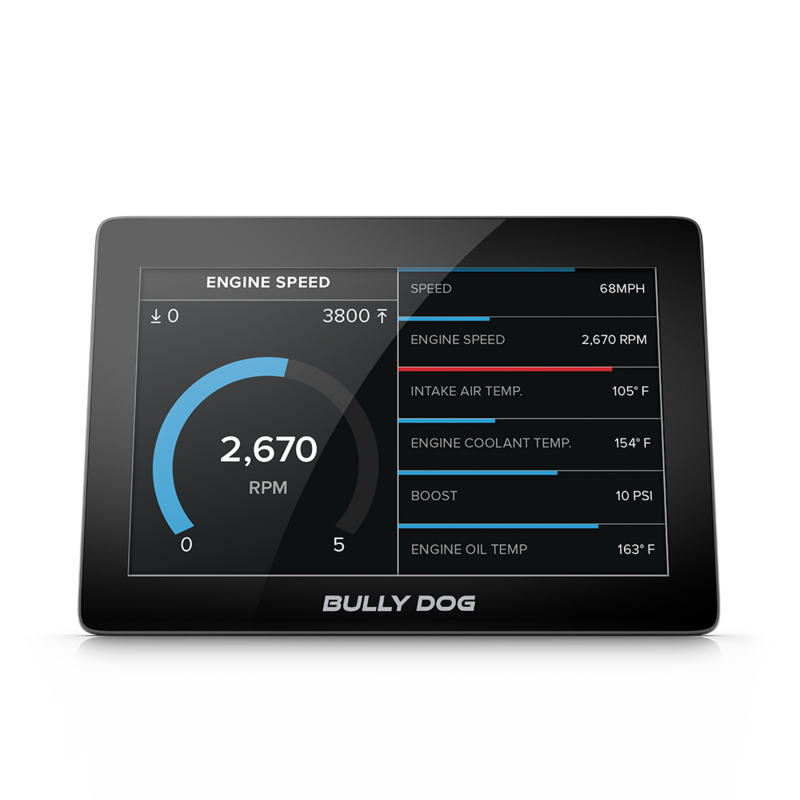 Bully Dog’s 5" capacitive touchscreen is the first of its kind. Graphics and gauges are displayed in brilliant HD color. A fully customizable user interface means the perfect gauge layout for your needs is available at the touch of the screen. The lightning-fast GTX Watchdog gives drivers the ability to monitor the industry’s most extensive SAE and Cummins-specific PIDs, or engine parameters, in real time. 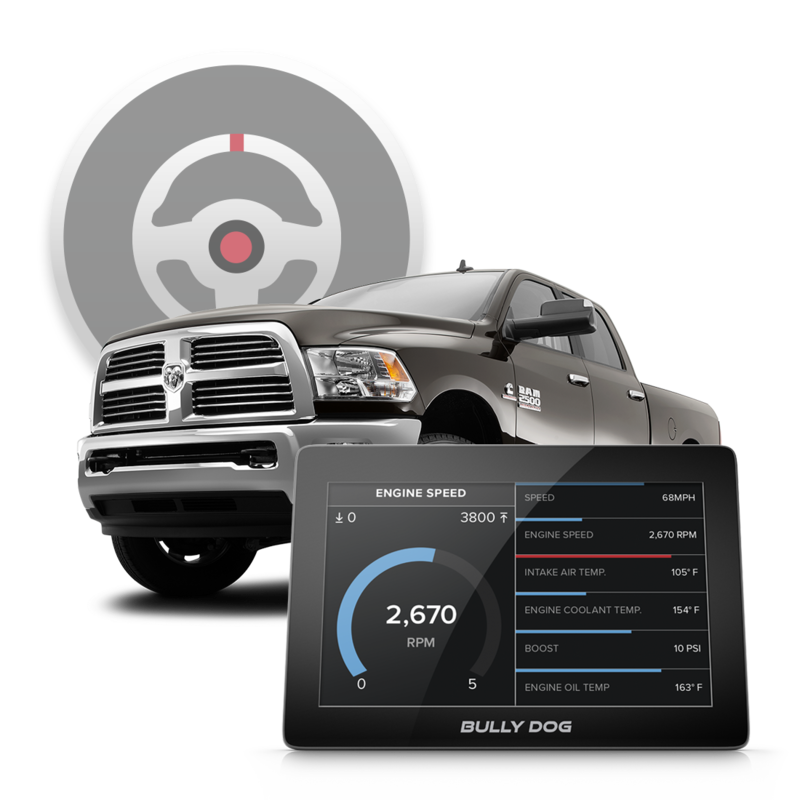 Datalogging capability makes it easy to record vehicle performance and play back later using Bully Dog’s free LiveLink software. GTX Watchdog also doubles as a diagnostic tool with the ability to instantly read and clear diagnostic trouble codes. Further customize your GTX Watchdog by adding additional sensors, using the integrated FireWire input. 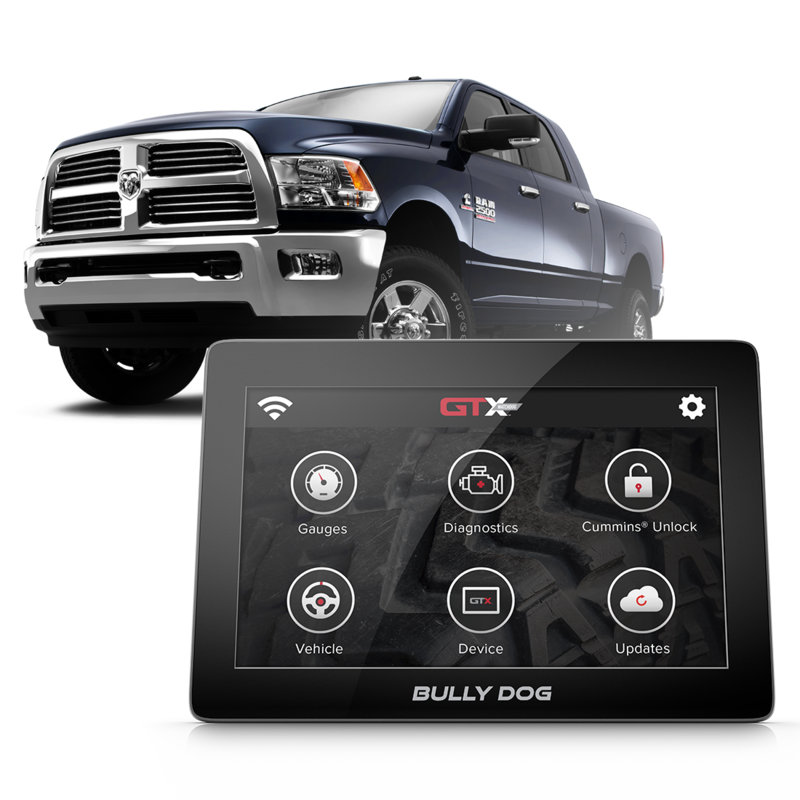 With the included Bully Dog Cummins Unlock cable, 2013-2016 Dodge Cummins owners can use the GTX Watchdog to unlock their truck’s computer for tuning. 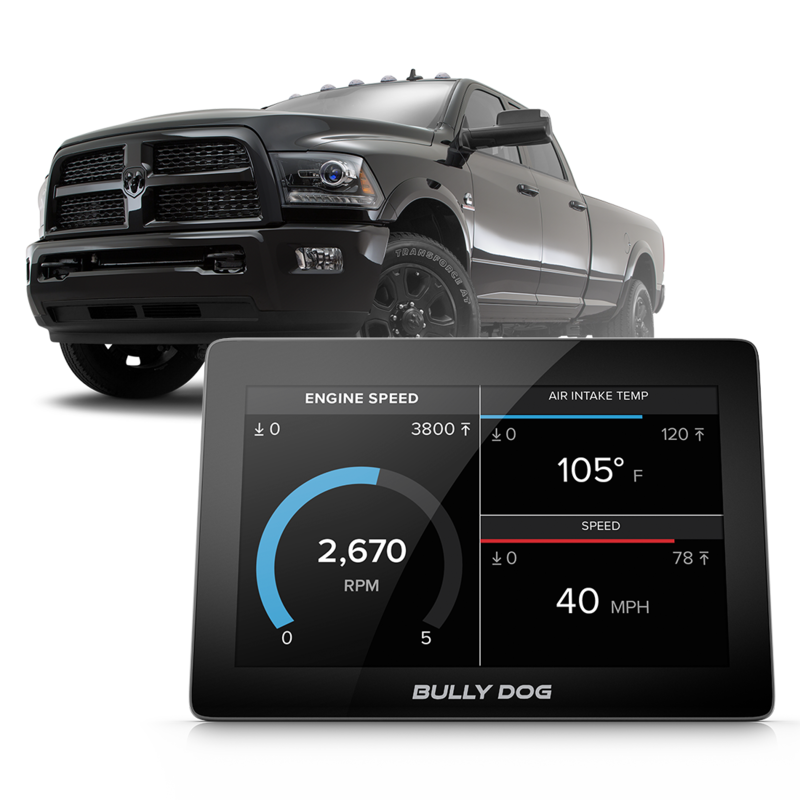 Bully Dog’s BDX and GT Diesel offer preloaded tuning for the 2013-2016 Cummins. 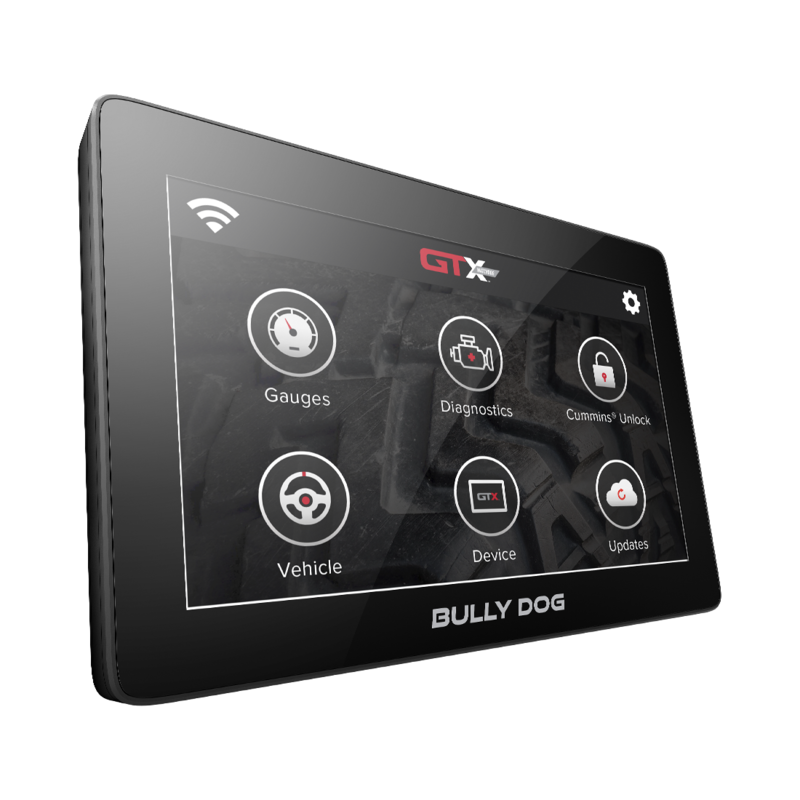 The Unlock provided by the GTX Watchdog is also compatible with other custom tuning solutions, enabling drivers to choose the best option to match their needs. Bully Dog does not currently offer custom tuning for Cummins. 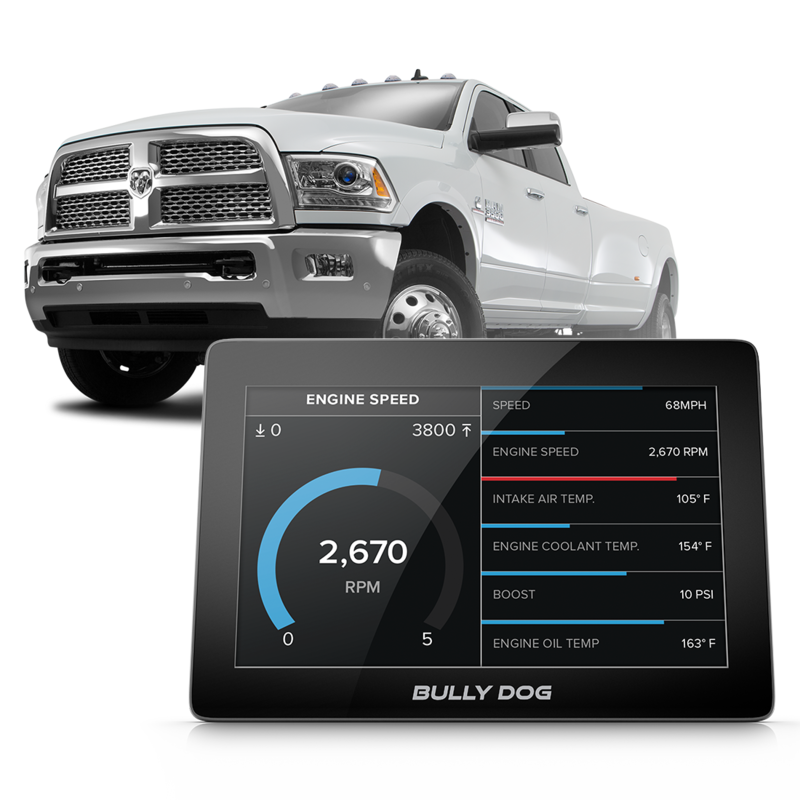 Bully Dog’s GTX Watchdog, optimized for 2013-2016 Dodge® Cummins® vehicles, is a revolutionary leap forward in performance monitoring–loaded with features and our most advanced hardware to date. 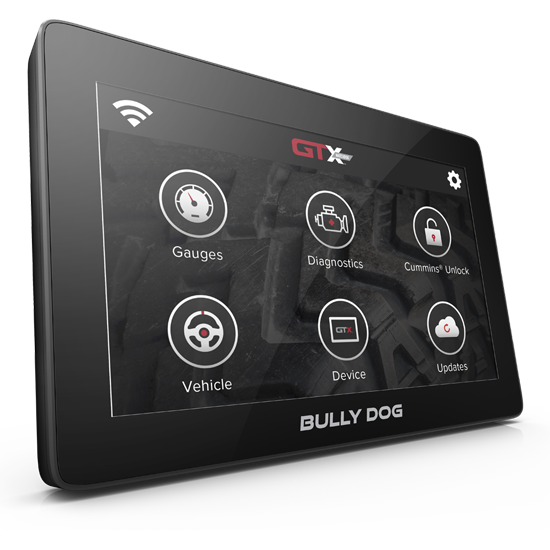 GTX Watchdog starts up incredibly fast (even when remote starting the vehicle), and is super responsive, sporting a 5-inch capacitive touch screen that rivals today’s smart phones. 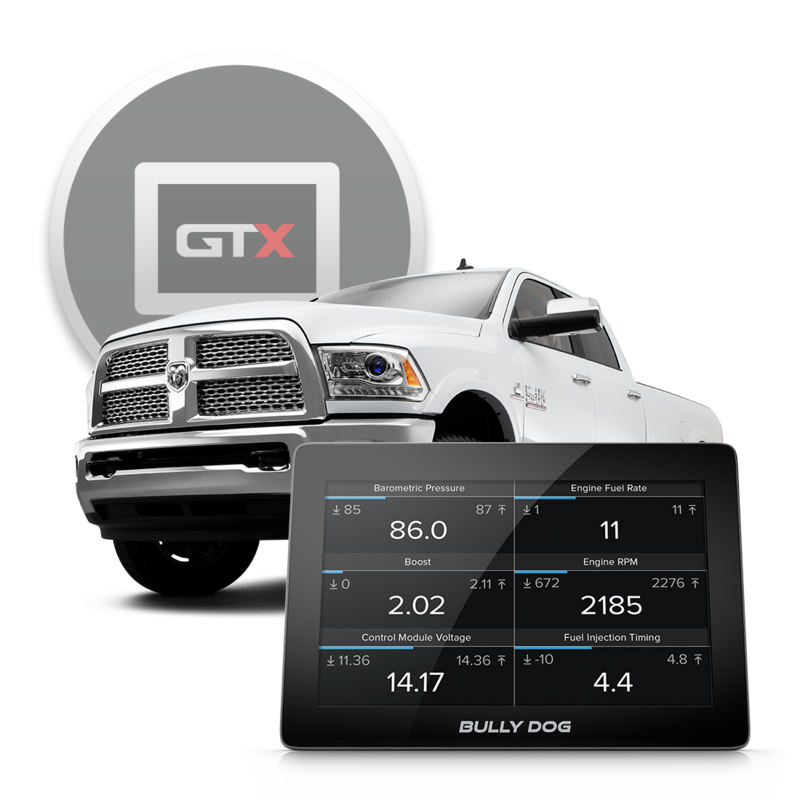 Optimized for Cummins, GTX Watchdog gives drivers the ability to monitor the industry’s most extensive SAE and Cummins-specific PIDs, or engine parameters, on an easy-to-use device. High-resolution customizable gauges and WiFi connectivity add to the truly unparalleled user experience. 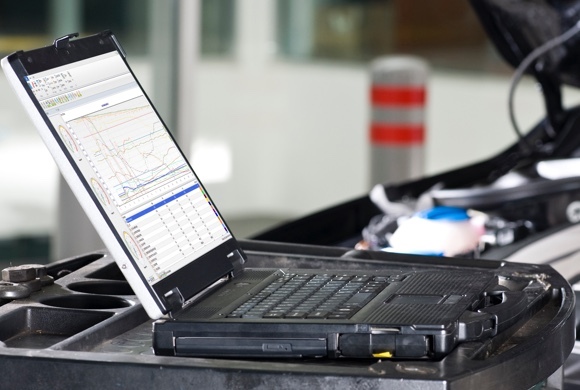 Drivers can log vehicle performance data as they drive–and play it back later using Bully Dog’s free LiveLink software. 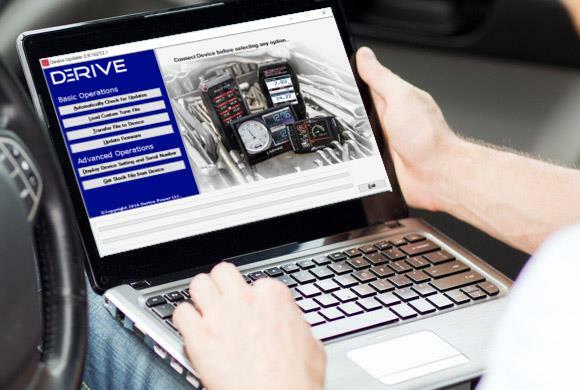 GTX Watchdog also gives users greater insight into their truck by reading out and clearing Diagnostic Trouble Codes (DTCs). 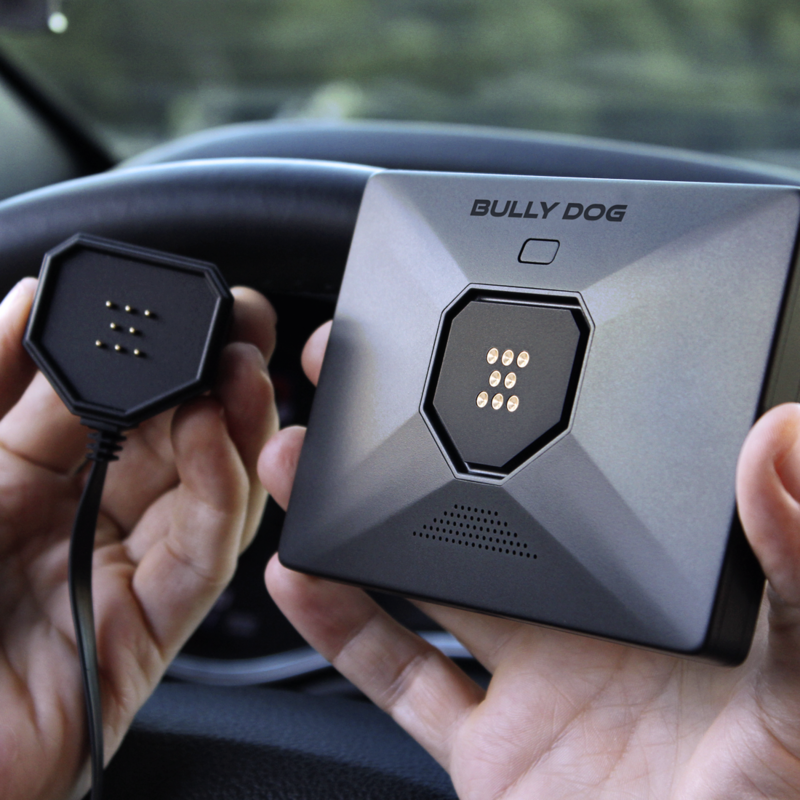 Bully Dog’s unique grab n’ go magnetic mounting system allows the device to be kept front-and-center while driving, and then quickly stowed away when not in use. 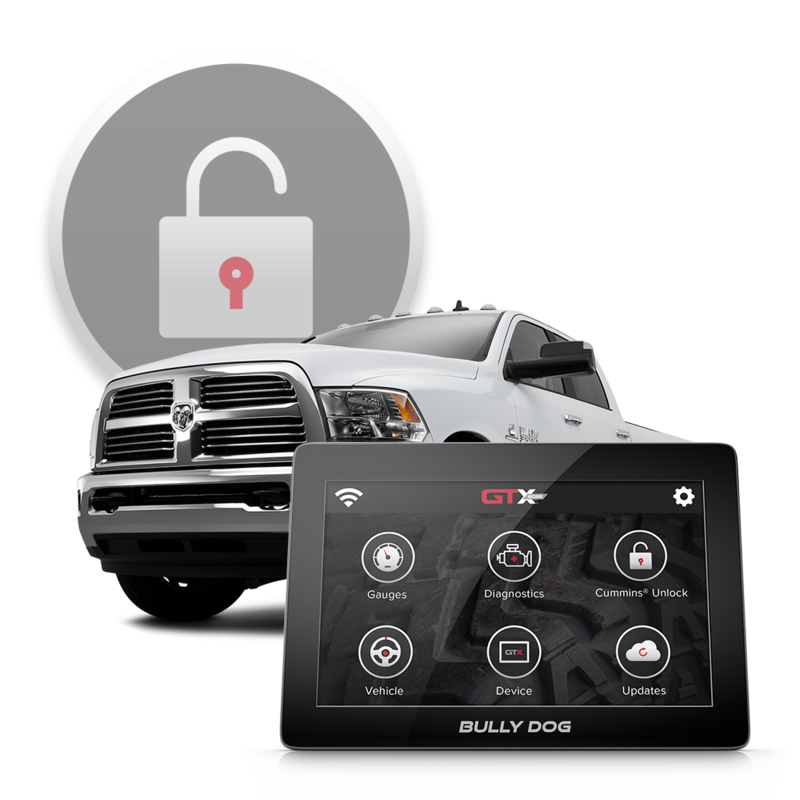 Finally, for those who want to take their truck to the next level, GTX Watchdog can unlock 2013-2016 Cummins vehicles (including chassis cab) for tuning using the included Bully Dog Cummins Unlock Cable. 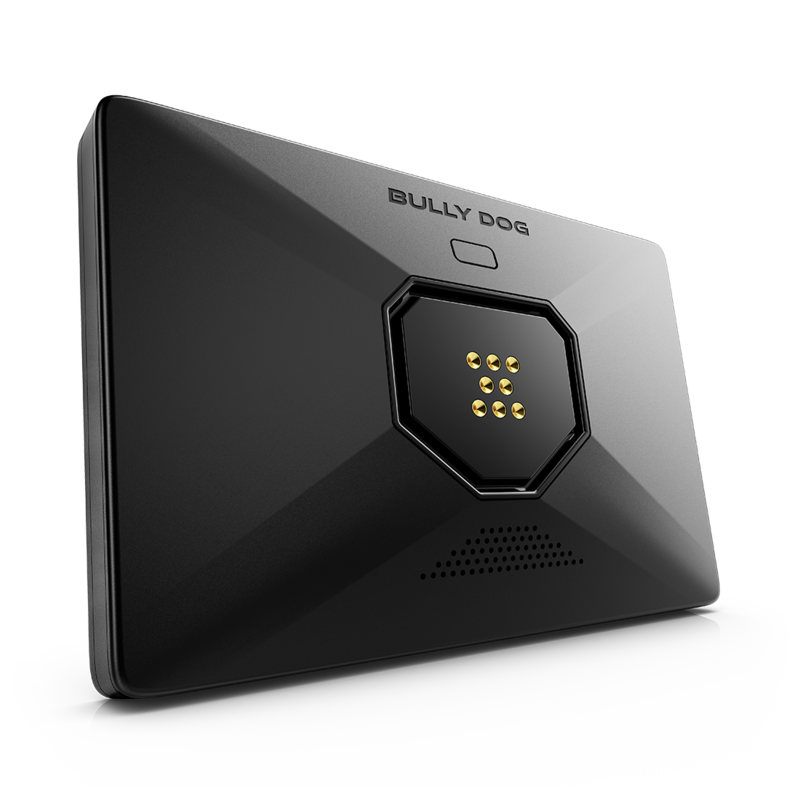 Bully Dog’s 5” capacitive touchscreen is the first of its kind. Graphics and gauges are displayed in brilliant HD color, rivaling today’s smart phones. GTX Watchdog starts up incredibly fast (even when remote starting the vehicle), and provides an ultra-responsive user experience. A fully customizable user interface means your perfect gauge layout is available at the touch of the screen. GTX Watchdog comes standard with a convenient grab n' go magnetic mounting system, enabling drivers to keep their device front and center–and then stowed away in seconds. The lightning-fast GTX Watchdog gives drivers the ability to monitor the industry’s most extensive SAE and Cummins-specific engine and transmission parameters, in real time. Unlike competitors, the GTX Watchdog provides monitoring capability of the Aisin & 68RE transmission, as well as chassis cab vehicles. The device’s datalogging capability makes it easy to record vehicle performance and play it back with Bully Dog’s free LiveLink software. GTX Watchdog also doubles as a diagnostic tool with the ability to read and clear diagnostic trouble codes (check engine light). With integrated WiFi capability, GTX Watchdog is always up to date. Tell us more about your experience with the GTX Watchdog. Your honest opinion helps people make smarter decisions. We all appreciate that.